This product is formulated without parabens, phthalates, sodium lauryl sulfate, mineral oil, petrolatum, synthetic dye, or synthetic fragrance. From tarte. Who is it for: Perfect for anyone who wants long-lasting, gorgeous lip color that glides on smooth. Line on unique lip looks with tarte’s twist-up, precise, tarteist Lip Crayon. 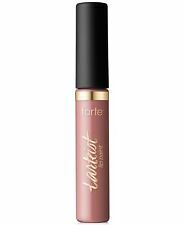 TARTE TARTIEST LIP CRAYON IN MOOD RING Deluxe Sample ~ Approx. Size: 3g /. 10 fl. - Full Size! · Shades may look different due to computer monitor settings; the color you see on the monitor will almost never match the actual item in person. Brand new in box. Tarte energy noir. Shipped with USPS First Class Package. MANUFACTURE: Tarte. CONDITION :All are new, and have ever been tested nor used. They are boxed.No seal. Wear to gold cap. SIZE: 0.10 oz Full. These have no expiration dates. Size: Full Size in. 10 oz. Line on unique lip looks with tarte’s twist-up, precise, tarteist Lip Crayon. These shades are great to wear alone or pair with your favorite tarte lipgloss. TARTE TARTIEST LIP CRAYON IN MOOD RING Deluxe Sample ~ Approx. Tarte Lipsurgence Lip Tint GRATEFUL. FULL SIZE. Condition is New. Shipped with USPS First Class Package. BNIB Tarte LipSurgence NATURAL BEAUTY Lip Tint .10 oz New! If an item doesn't show a box or seal this is how you will receive it. We try to provide all known information. They may have swatched marks on them. If an item doesn't show a box or seal this is how you will receive it. We try to provide all known information. Tarte Lipsurgence Natural Lip Stain Tint "Charmed" (light pink) Full Size! NEW! Full Size! After 10 years the wait is finally over. Quick Dry Matte Lip Paint. New In Box. Tarte LipSurgence Natural Lip Luster "Escape" (pink) Holiday Full Size! NEW! A GORGEOUS pink shade ! (with gold cap). From tarte. It is much appreciated! I want your experience to be a pleasant one. "Flush" is a beautiful, semi-sheer pink berry color. /1g (full size). (Shade: Flourish. a plummy rose shade. and It Does Not Affect the Products in Any). Tarte Lipsurgence Natural Lip Stain Tint "Elite" (melon shade) FS! Holiday! NEW! Tarte Lipsurgence Natural Lip Stain Tint "Joy" (peach) Full Size! NEW! Full Size! New (no box, never opened) Joy (peach). After 10 years the wait is finally over. Tarte LipSurgence Natural Lip Luster "Exotic" (raspberry) Holiday! NEW! A GORGEOUS ra spberry shade ! From tarte. Tarte LipSurgence Natural Lip Luster "Sweet" (peachy pink) Holiday! NEW! A GORGEOUS peachy pink shade ! Limited Edition! From tarte. Tarte Pure Delights 8-Piece LipSurgence Lip Set NIB! Ist Quick Dry Matte Lip Paint - # Vibin 6ml. A rich lip stain that provides full color coverage. Leaves a quick-dry matte finish in seconds without cracking or bleeding. Renders a transfer-proof makeup effect. Quick Dry Matte Lip Paint. Effect Matte. New In Box. Size Full Size. UPC 846733020225. Declaration Notices: on parcels cannot be declared at a lower value. All orders will be declared at cost price. Size 6ml/0.2oz. Category Make Up.